In this workshop, you will learn how to mix our own paints to achieve that special “embossed effect”, select the best combination of colors, how to work with colored paper, and store paints for long-term use. This is a hands-on workshop, so it’s best you come in your most comfortable clothes! Bring your own pointed pen nibs and penholders. Note: as this is an intermediate workshop, participants are expected to have some understanding with calligraphy writing. We will not be covering basic calligraphy strokes and letter forms. 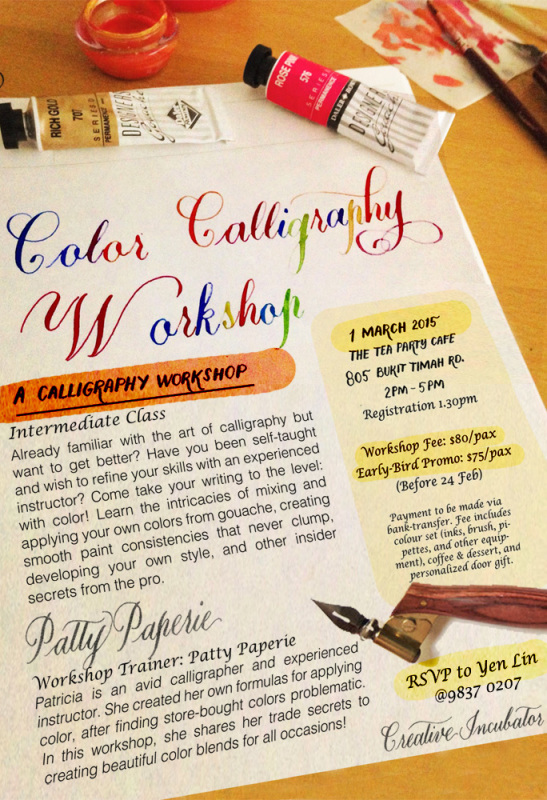 If you are a beginner to calligraphy, join the next beginner class on 14 March. Coffee and dessert are provided, as well as a personalised door-gift. Limited seats are available to ensure that every participant is well-guided.